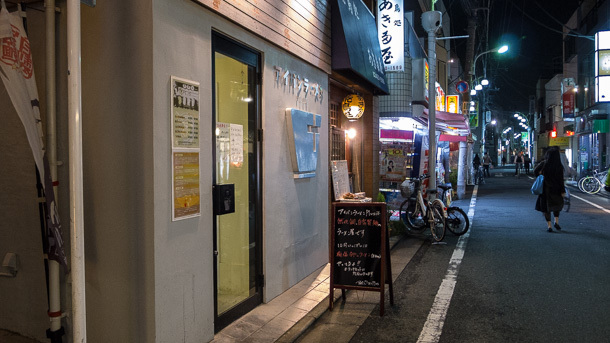 Previously, we visited the original Ivan Ramen in Roka-kōen for the earthy shio (salt flavored) ramen that gained Ivan Orkin his spot on the Tokyo ramen map. 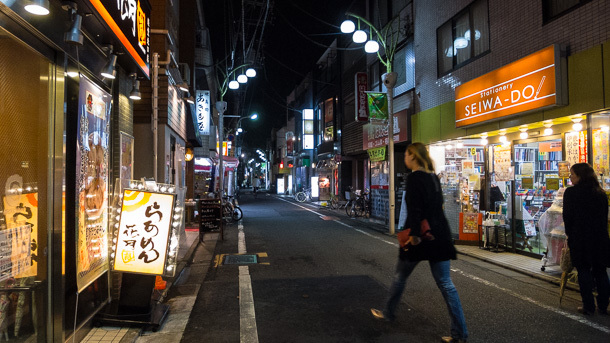 In volume 2 of The Tokyo Project, we head to Kyōdō, also in Setagaya Ward, for dinner at the second shop, Ivan Ramen Plus. 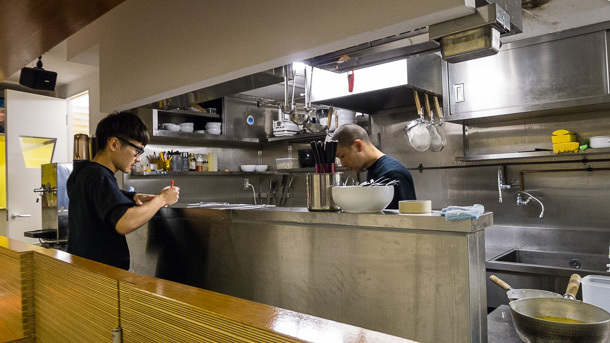 Both locations use warm wood finishes on the bar, but where the first is a cozy affair of eight or so stools in a small but bright and airy stall of a neighborhood shopping arcade, Ivan Ramen Plus (アイバンラーメンプラス) is comparatively spacious and more modern, with clean lines, bare walls and a large, stainless prep area. 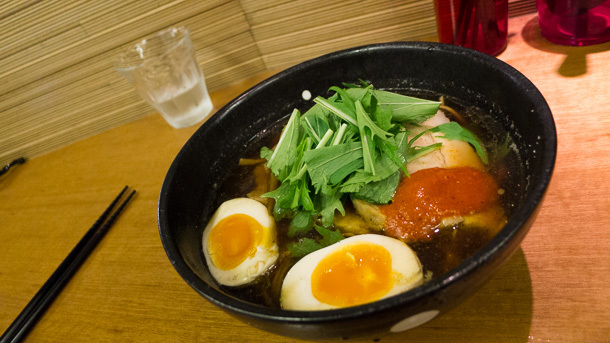 Ivan Ramen Plus is intentionally more experimental, with a menu including several items that incorporate soymilk or cheese, as well as some sides that you won’t find on the menu at Ivan Ramen. While you can get the standard shio and shōyu (soy sauce flavored) at Ivan Ramen Plus, I went with the ago dashi, which is only served here. As I understand it, this bowl uses a soup based on dashi stock—typically made by steeping katsuobushi and kombu—then further intensified with dried flying fish, dried scallop and dried squid, though I don’t have Ivan’s exact recipe at hand. The intense fish flavor is definitely unique among Ivan’s noodles, but is still light and refreshing. 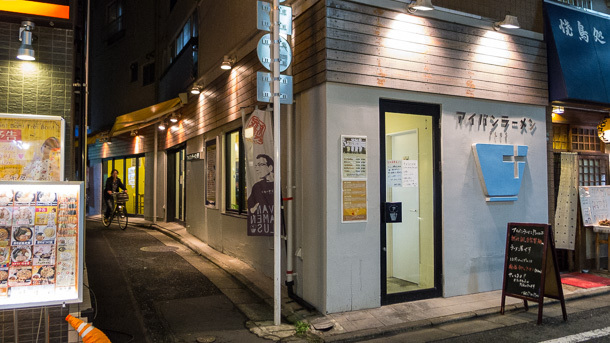 Ivan Ramen Plus is also in a local shopping street, the Kyōdō Suzuran Shōtengai (経堂 すずらん商店街), which in an open air street rather than a covered, pedestrian arcade like in Roka-kōen. 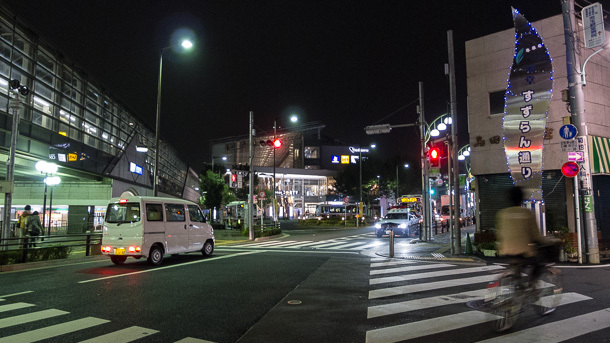 The shop is easily reached with a couple minutes’ walk north from Kyōdō Station. Being easy to get to came in quite handy in this particular instance, as I had forgotten to check the shop schedule and previously came on its off day! Though, even had it not been as simple as a quick trip on the Odawara Line, the prize at the end would have been more than worth a second attempt.